Club Meeting is every first Monday of the month at the Staunton VFW at 10am. where we get together as a group to show off our projects. There is a project, tip and technique and of course our fabulous sew in tell. Next meeting is March 4th. 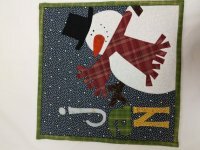 Wool Applique Class: Sat March 23rd 9am - 2pm, taught by Kay. Kits are available many to choose from. We are in the midst of building a bigger shop. As soon as we get there we have a list of new classes and events that will be starting up. Our goal is to have the following things available monthly. 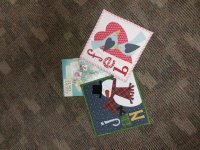 A "Club" of Red work, Applique, Block of the Month, Mystery, Wool, Runner, Bag, Embroidery, Distinctive Dresden etc. I do not require that you must buy your supplies at my shop in order to take any of the classes, I love the fact that you can use whatever makes you happy and use up those wonderful scraps! You can borrow rulers from friends...etc...I only ask that you purchase your pattern that is being used and it does not have to be with me. 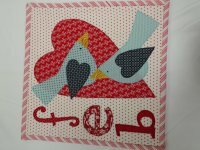 Quilting is so fun, no need to stress over these little things!